Jeffrey P. Berniard founded The Berniard Law Firm in 2004 in order to defend the rights of Louisiana residents seeking justice and fair representation in the court of law. He is a champion for those facing uphill challenges associated with their claims, and no case is too big or too small for Jeffrey Berniard to give his full consideration and scrutiny to the case in order to have his clients receive deserved adequate compensation. Jeffrey Berniard is a Louisiana native, hailing from Lake Charles, who studied at Loyola University New Orleans College of Law. Jeffrey Berniard is a devoted husband and father, balancing his work with loving care to both his family and his community. Jeffrey Berniard met his wife, Melissa Berniard, at Loyola University New Orleans School of Law and married her in 2005 after the couple graduated law school. Melissa is a lawyer in the community as well, and supports Jeffrey as he strives for justice in Louisiana. Melissa is from Dothan, Alabama and received her undergraduate degree from Auburn University. Jeffrey and Melissa have two children. Seven year old Banks attends the Trinity Episcopal School in New Orleans and five year old Birdie attends the Academy of the Sacred Heart. Jeffrey and Melissa understand the importance of establishing a foundation of excellence in education and community service and are proud to send their children to schools that focus on learning and improvement, not just in the classroom, but also in the community. The Berniard Family attends both the Trinity Episcopal Church and St. Andrew's Episcopal Church in New Orleans. The Berniard's pursue love and kindness to all and build their faith through service. When not participating in Church activity, the Berniard's can be found spending time in New Orleans historic parks. The family enjoys spending leisure time in the Audubon Park in historic uptown New Orleans, playing on the playgrounds or lounging under the ancient live oak trees. The Berniard's have two dogs, a Labrador Retriever and Chihuahua, who enjoy playing at the New Orleans City Park, one of the nation's oldest parks, having been established in 1854. The historic oaks and picturesque moss canopies of the park were once the backdrop for dances, concerts, and gentlemanly duels, but now provide space for the Berniard's and their dogs to frolic and play. 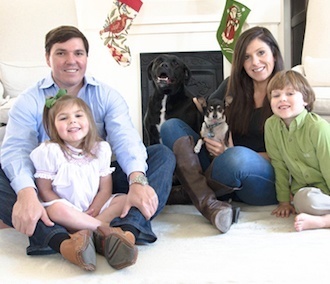 The Berniard's also are foster-parents for dogs that need a home while they search for their permanent families. Jeffrey Berniard is a member of the American Association for Justice and the New Orleans Trial Lawyers Association, working to promote fairness and equality in the courts. In his free time, Jeffrey Berniard also coaches flag football for the Carrollton Boosters and enjoys working out at Crossfit NOLA and running through New Orleans' parks and the campuses of Tulane and Loyola University. Despite only having 24 hours in the day, Jeffrey Berniard stays functionally fit by running and practicing Crossfit, and does it all while still being a husband, father, and protector of the rights of Louisiana residents in every city in the state. Jeffrey Berniard is an avid New Orleans sports fan, as a season ticket holder to the Saints and someone who frequents both LSU football and New Orleans Pelicans games. The Berniard's enjoy eating out and supporting local restaurants, and you can find them at local festivals, including the Jazz Fest and French Quarter Fest. In all, you can trust that Jeffrey Berniard will take a personal approach to your case, using his decade of effective litigation experience and connection with the state of Louisiana to achieve success for each client. Choosing The Berniard Law Firm means choosing a local, reputable, connected firm, with deep roots in the community, and doing so ensures that your best interests will be fought for and the financial restitution you deserve will be obtained. Contact Jeffrey Berniard today at 504-527-6225 .